Call 811 or use the online ticket system at 811express.com at least two working days prior to starting work. Review these tips with coworkers at your tailgate or tool box meetings before work begins to help avoid potential hazards when working near overhead and underground utilities. Carefully examine the site for overhead power lines, utility poles and support wires, and point them out to coworkers. Take extra care to look for lines that may be masked by foliage or otherwise blocked from view. Assume all overhead lines are energized and potentially dangerous, including the service drops that run from utility poles to buildings. Clearly mark boundaries to keep workers and equipment at least 10 feet* away from all overhead lines. It is a CAL OSHA violation to work or have equipment extend into the 10-foot zone for distribution utilities, and larger distances for higher voltages. *Cranes and derricks used in construction must stay at least 20 feet away from lines up to and including 350,000 volts, and 50 feet away from lines greater than 350,000 volts but at or less than 1,000,000 volts, until the operator has taken specific safety measures. Consult the Cal/OSHA regulations at dir.ca.gov/Title8/sb4a15.html for specific safety clearance requirements and encroachment prevention precautions. Designate a spotter whose only job is to watch your equipment and make sure you maintain the mandatory safety clearance. Contact Underground Service Alert (USA) at least two full working days before you dig or move earth in any way. USA will notify underground operators to locate and mark buried utilities so you can work safely. Call 811 or use the online ticket entry system at 811express.com. Allow utilities the two full working days to locate and mark lines prior to digging. If you don’t call and you hit an underground line, you could be hurt or killed. You may also be held liable for damages. Always be aware of pipeline markers that indicate the need for extra care around a high-volume natural gas transmission line. These markers show the line’s approximate location, but not all pipelines follow a straight path between markers. You are still required to call USA 811 before you dig or move earth in any way. After you are sure underground lines have been marked, respect the marks and dig with care. For your safety, do not use power-digging equipment within 2 feet of either side of marked utility lines. 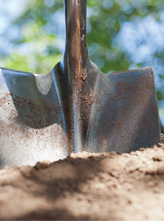 Hand dig with a rounded shovel, using a gentle prying motion to break away soil as you approach the utility laterally. e-SMARTworkers website. Here you can also order free safety materials for contractors or tree workers. Do you like this email series? Do you find the information helpful? We’d like to know. Please reply to this email, and tell us what you think or let us know what topics you’d like to see in future emails.